Paradise Studios offers the full spectrum of Interior Design styles from Sleek Contemporary, Modern Luxury, Transitional, Traditional, Rustic to Old World Mediterranean. Whatever your interior design needs, we stay on the cutting edge of design trends to collaborate with you to an inviting space with the wow effect. Client satisfaction is a very important to us at Paradise Studios. We take time to understand your vision and needs for your project and make sure you are happy every step of the way. 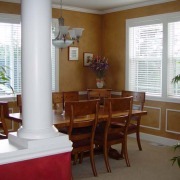 It is our goal for you to you be in love with your space when we are finished and to have exceeded your expectations. Through the years we have completed projects in Casinos, Restaurants, Wineries, Retail Stores, Medical Clinics, and many Beautiful Homes. Bringing years of experience, with our creative edge and design expertise your project comes to life. “This is my second time using Raya and Heidel, the first was 2003 when they transformed the two story entry of my then house. 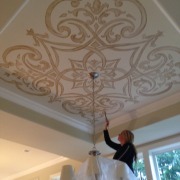 In my new house the project was dining room ceiling and master bath wall. We used an inspiration photo I already had for the master bath wall. 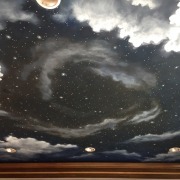 For the dining room ceiling I chose a design suggestion they presented to me. I love the way it fills the space and enhances the style of my house.